The heart of the Sky Theater of the planetarium is the star projector. 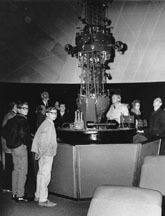 When the planetarium was originally constructed, a Spitz Intermediate Space Transit Planetarium (ISTP) projector was installed. The Spitz ISTP projector was an optical-mechanical system that was one of the most advanced planetarium projectors of its time. The Spitz ISTP incorporated miniaturized electronics and components and therefore weighed less (under 1,000 pounds) than most projectors of its time. This reduction in weight and inertia allowed the projector to move in ways other projectors could not. 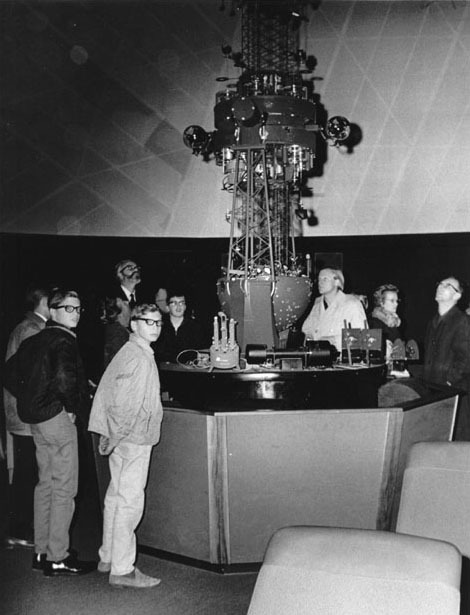 In fact, the projector was able to move in three axes of motion, thereby allowing the planetarium to simulate the movement of the stars through the night, but also the movement of a vehicle in space. 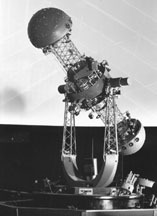 The optical-mechanical nature of the Spitz ISTP meant that it projected the night sky onto the dome by the use of lights and lenses. The projector consisted of a Star Hemisphere at either end of the projector. Each Star Hemisphere had charts of the night sky mapped on them. Light was emitted from the hemispheres through over 4000 small holes that represented the dimmer stars, or over 200 larger ones which contained lenses and filters, to represent the brighter stars and objects in the night sky. The light that was emitted came from high pressure Xenon gas arc lamps placed within the hemispheres. 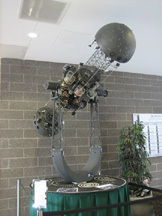 The projector also contained Instrument Analogs which allowed it to simulate the motions of objects in the solar system. The Instrument Analogs duplicated the motions of the five observable naked eye planets as they traveled through the background stars. The Spitz ISTP also would allow for the a simulation of the Moon and the Sun through the sky. 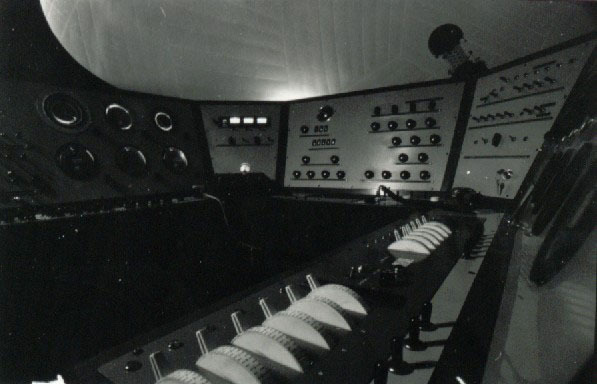 The projector was operated from a Control Console found at the back of the theater. From this area the operator could adjust show volume and cove lights along with adjust the motions of the stars, planets, Sun, and Moon. 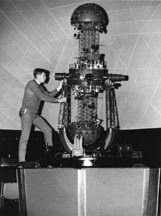 The Spitz ISTP projector installed in the Abrams Planetarium was only one of less than a dozen ever produced, in fact it was the prototype of the model. Although advanced for its time, the projector eventually began to show its age as technological knowledge increased. In 1993 the Spitz ISTP was retired and was removed from the Sky Theater, to be replaced by the Digistar, a digital star projector. Although it is no longer used, its memory still persists and many patrons wonder what ever became of the star projector that excited their interests in astronomy when they were children. 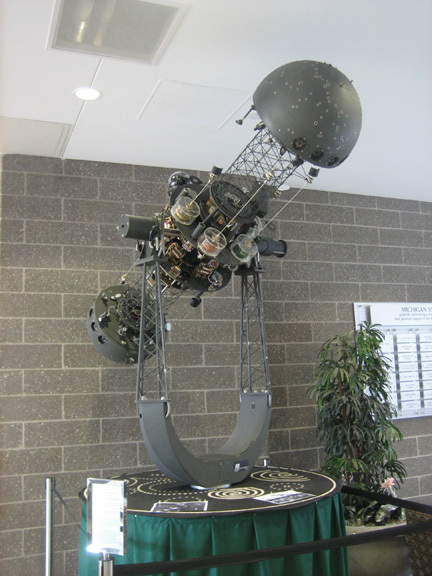 In celebration of the Abrams Planetarium 50th Anniversary in 2014, the Spitz ISTP projector has been placed on display in the atrium of the Biomedical and Physical Sciences (BPS) Building, located across the street from the planetarium.